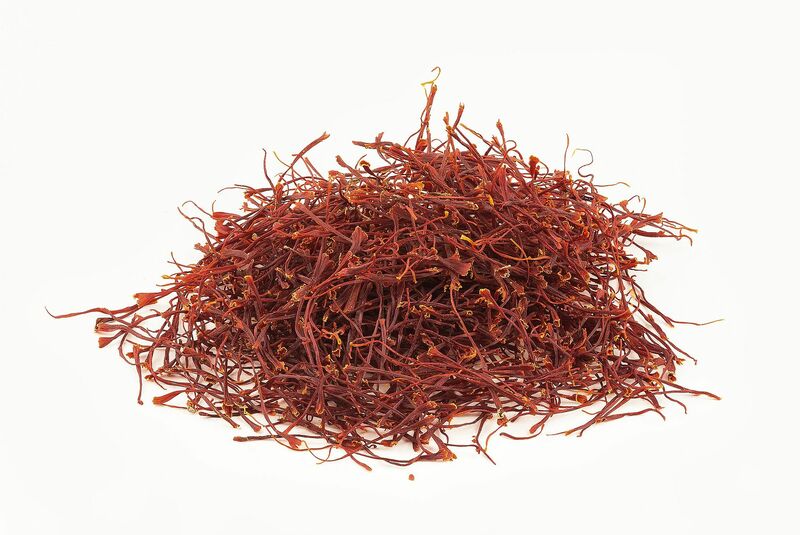 You may know that saffron is the most expensive spice in the world. A Spanish farmer sold his crop of high quality saffron this year for four euros per gram, which is a ninth of today’s price of gold (36 euros per gram). Saffron is expensive because its production requires a huge amount of labor and land. 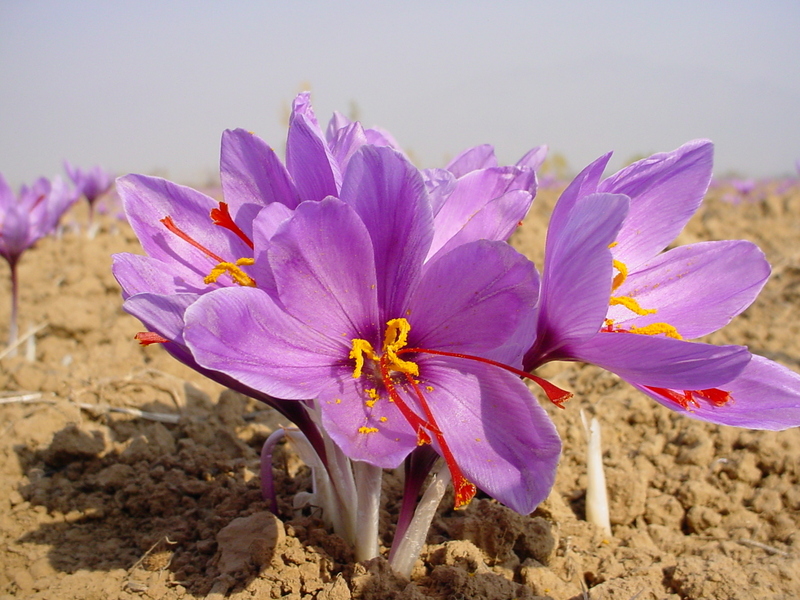 Saffron production is labor- and land-intensive because saffron is a botanically unique food item that defies mechanical harvest and accounts for a miniscule proportion of the plant that bears it. The saffron threads sold as spice are the dried stigmas of the flowers of the saffron crocus (Crocus sativus, family Iridaceae). Recall that the stigma is the part of the flower’s female reproductive organs that catches pollen. Pollen travels from the stigma through the style into the flower’s ovary (collectively, the stigma, style, and ovary comprise the pistil). saffron crocus blooming in Kashmir, showing three red stigmas and yellow pollen-bearing stamens. Photo source here. Each saffron crocus flower—no bigger than the common crocus flowers sprouting up in temperate lawns and gardens each spring or autumn—produces three relatively large, elongated stigmas. Each saffron crocus plant produces one to four flowers each year, blooming in the autumn from perennial underground corms. Each gram of dried saffron contains stigmas from 110-170 flowers. Only the stigmas (otherwise known by fun alternative plural term “stigmata”) bear the distinctive bright orange-yellow pigment and aromatic compounds that define saffron. 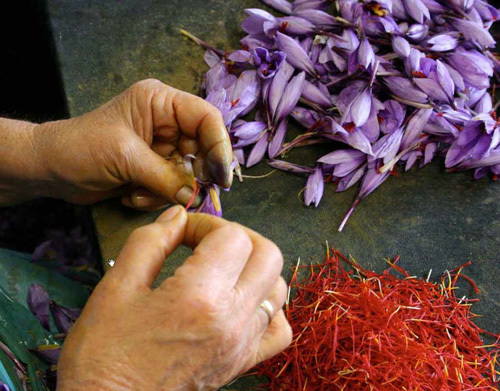 Harvesting any flower structures other than the stigmas, namely the styles that connect the stigmas to the remainder of the flower’s female reproductive organs or the stamens bearing pollen (the male parts of the flower), significantly reduces the saffron’s quality. Therefore, the stigmas, and only the stigmas, must be carefully hand-plucked from fresh flowers and immediately laid out on screens to dry. 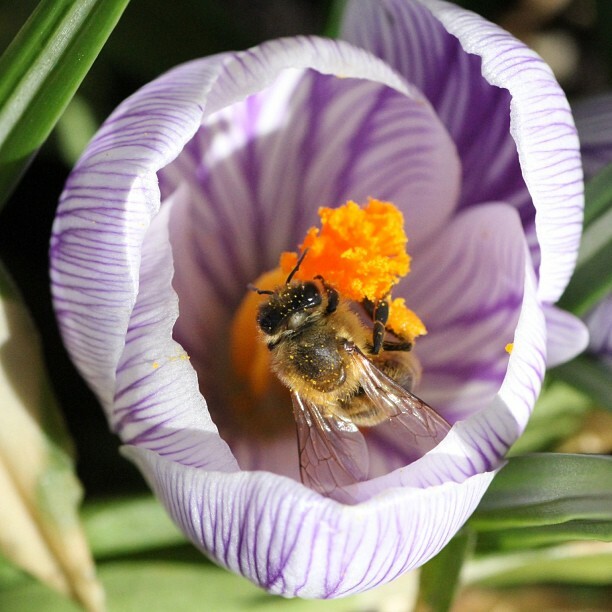 Bee interacts with a crocus stigma. Photo source here. In general, stigmas evolve in response to the pollination environment, including how much pollen is available and the means of pollination (Barrett et al. 2004, Costa et al. 2014, Cruden and Miller-Ward 1981), bees in the case of crocus. As I’ll discuss below, pollination success in saffron in particular doesn’t actually matter, as it’s a sterile triploid, but it clearly mattered in its crocus relatives. Large stigmas help ensure that a flower receives enough of the right kind of pollen (same species, different individual). Having multiple large stigmas might also maximize the chances of successfully brushing pollen off a bee’s body as it forages for nectar and pollen. Large stigmas might also reduce competition between pollen grains by spreading the pollen grains out, which may be advantageous in plant populations where inbreeding is high by genetically diversifying the set of pollen grains that end up producing seeds (Armbruster and Rogers 2004). How those evolutionary stories have played out specifically among crocus species, though, I don’t know. Saffron stigmas are chemically unique. The highest quality saffron comes from stigmas harvested the morning the flower first opens (Rubio-Moraga 2010). At that time the stigmas have not yet caught any pollen, which would be a culinary contamination, and they have the highest concentrations of the distinctive aromatic, flavor, and pigment compounds (mainly carotenoid derivatives safranal, picrocrocin, and crocin) that characterize saffron and the lowest concentrations of any other compounds or decay that would reduce its clarity of flavor or color (Lage and Cantrell 2009). In an email, saffron enthusiast and botanist extraordinaire Pat Heslop-Harrison told me that there have been a few studies on the stigma chemistry in other crocus species, and some of them do have the distinctive saffron aroma and color compounds, but they are far more dilute than in saffron. The color and fragrance of stigmas may aid in attracting or directing pollinating insects or may chemically defend the stigma or serve a physiological role (Rubio-Moraga 2010). Again, this distinctiveness is due to some combination of agricultural selection for those compounds and the wild plant breeding process that resulted in saffron. 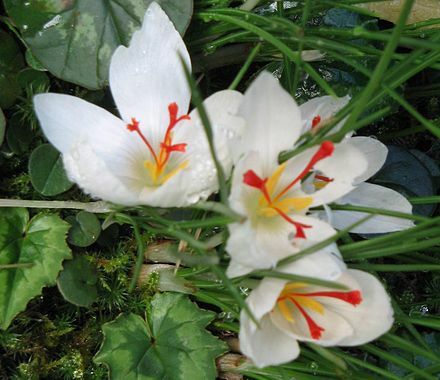 Crocus cartwrightianus, the wild ancestor of saffron, a white morph. Photo from Wikipedia. Unlike its putative wild relatives whose genomes are diploid (two copies of all chromosomes) or even-numbered polyploids (more than two chromosome copies, but an even number of copies), saffron is triploid (three copies; Alsayied et al. 2015), which happens in plants far more than in animals (see Katherine’s essay on triploid watermelon for more details). The triploid saffron is male sterile and is propagated vegetatively by splitting the corms that grow in a colony, meaning that all saffron plants in the world are nearly genetically identical clones (like tarragon and fellow monocots banana and garlic; Alsayied et al. 2015). I don’t know if triploidy in particular affects saffron stigma chemistry, but it does make it unique among crocus species. It takes a few years for a saffron corm to reach the size and vigor required to produce multiple flowers bearing large stigmas (Rubio-Moraga 2010), so saffron farming is a long-term project requiring a dedicated plot of land. Though saffron’s early history is a mystery, we know that it came from somewhere in the Middle East or eastern Mediterranean region, and most of it is still grown there. Saffron grows well in those sun-drenched, medium-dry places, but it’s a pretty forgiving plant (Molina et al. 2005) and is currently cultivated in many regions outside of Eurasia. The generous pinch used in a typical family-sized dish contains 10-20ish stigmas, so if you live in a place friendly to crocus, you could probably easily grow enough for one or a few dishes, even if you have to grow them in a pot and bring the corms in every winter. 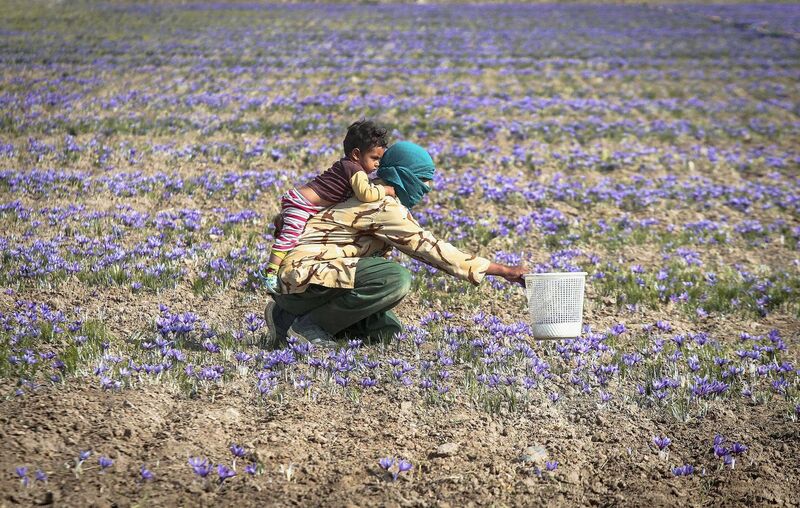 A woman harvests saffron blossoms in Iran. Photo source here. Saffron’s price makes the spice a luxury for most people, but it also makes saffron a stable, lucrative crop for farmers, especially in arid places or in marginal land where other crops might be less cost effective (Gresta et al. 2008). A few American Army veterans who served in Afghanistan recently returned to that country, where 80% of the people work in agriculture, in a massively successful business venture to connect Afghan saffron farmers with western buyers. Some farmers in Vermont and New Zealand are starting to grow it, though labor costs there are a concern. The saffron cultivation picture is not golden everywhere, though. For example, old saffron fields in Kashmir, long famous for its saffron, are rapidly declining in response to increased urbanization and industrialization and increasingly frequent and intense droughts, likely a consequence of anthropogenic climate change (Altaf et al. 2016). Climatically forgiving though it may be, saffron clearly has limits (Molina et al. 2005). When I think of saffron-infused dishes, sumptuous comfort food comes to mind: Swedish saffron buns, savory custards, Rogan Josh curries, paella, creamy soups (see below for the recipe for the cauliflower-saffron soup invented by my illustrious co-author Katherine). This is food for brightening dark days. It’s food that reminds us that people the world over grow beautiful things. It’s food for fortifying ourselves and sharing because we must be in this together. It’s food for reminding us that female anatomy should be treated with care, and that the topic of pendulous organ size should be relegated of scientific, agricultural or private (dinner table?) conversations, not presidential debates. There should be a stigma against bucking democratic norms and common decency (I’m not sorry for the botany pun). There should not, however, be a stigma against scientists describing truth as we see it through our well-honed lens. Science should never be politicized (although vegetables sometimes are), but scientists can and arguably should share knowledge with the public. My favorite saffron recipe is Deborah Madison’s saffron custard over an eggplant-tomato gratin. I’ve made that dish (from the version in The Greens Cookbook) many times, although it’s been a while. I think I’ll put it back in our family’s dinner rotation, to have this food be part of the fabric of our lives at this historic juncture, to be part of the memories my two small daughters have when someday, when they’re old enough, they look back and ask me what I did to help. I might start by making this absolutely amazing Middle Eastern flourless saffron-orange cake, which doesn’t help but at least feels a little bit subversive and cathartic. Maybe someone can help me come up with a dish that combines corn and saffron to celebrate extraordinary lady bits in honor of the next women’s march. One of the things I will do to help is to continue sharing facts about the plants that occupy our lives. Not alternative facts. Facts. Actual, objective, repeatable, empirically demonstrated, scientifically agreed upon, appropriately detailed and nuanced, reputably referenced facts. l will do so because I love facts and believe that facts make navigating and caring for the world a more enjoyable and effective endeavor. I caught a few minutes of an interview on NPR this morning with satirist John Oliver in which he had this awesome thing to say: “I care about facts the way I care about oxygen and imbibing enough water a day to live. Everybody should care about facts. That is something all of us should agree on.” And now you have the facts about saffron. So grab ahold of some stigmas and make something excellent happen. To use saffron, it’s best to infuse it for a few minutes first in a few tablespoons of hot water, milk, or cream, then using both the liquid and the threads in the dish. For this recipe, infuse a generous pinch of saffron threads in 3 tablespoons of not-quite-boiling water. Cut up a head of cauliflower into small pieces and sauté it briefly in lots of butter mixed with olive oil (or just oil if you want it to be vegan) in a deep sauté pan. The cauliflower should have just a few browned spots on the outside, but it is not meant to be cooked through at this stage. Add to the pan a big handful (like a cup) of almonds (seed coats removed if possible; fancy marcona almonds if you have them) and sauté 2 or 3 mins until you smell the nuts toasting a little bit. Do not burn the nuts. Add a big splash of white wine (a clean crisp sauvignon blanc is best) and let the alcohol evaporate before adding just enough water to the pan to cover the cauliflower. Simmer until the cauliflower is soft all the way through. Add the saffron and its infusing liquid and stir it into the mixture. Let the soup cool before blending it in a blender. An immersion blender will work, but a regular blender gives the soup the smoothest texture. Add more water to thin as needed. Add salt and black pepper to taste. If you want to enhance the cauliflower flavor, stir in a bit of prepared brown mustard, but add just a little at a time. The mustard flavor will be more pronounced when the soup is hot. Do not use purple cauliflower unless you want pinkish grey soup. Yellow or white cauliflower is prettiest. Serve with a scatter of toasted salted almonds (and/or sautéed greens, minced fresh herbs, parmesan cheese, diced tomato or peppers, caramelized onions, a julienne-cut carrot salad, bacon, duck confit…). Alsayied, N. F., J. A. Fernández, T. Schwarzacher, and J. S. Heslop-Harrison. 2015. Diversity and relationships of Crocus sativus and its relatives analysed by inter-retroelement amplified polymorphism (IRAP). Annals of Botany 116: 359-368. Altaf, Y., R. Kumar, R. Mir, and O. Ahmad. 2016. Evaluation of emerging trend of saffron (Crocus sativus) vis-à-vis climate change in temperate region of Kashmir valley, India. Journal of Soil and Water Conservation 15: 345-348. Armbruster, W.S., and D. G. Rogers. 2004. Does pollen competition reduce the cost of inbreeding? American Journal of Botany 91: 1939-1943. Barrett, S. C. H., L. D. Harder, and W. W. Cole. 2004. Correlated evolution of floral morphology and mating-type frequencies in a sexually polymorphic plant. Evolution 58: 964-975. Costa, M. F. B., J. V. Paulino, C. R. Marinho, V. G. Leite, G. D. Pedersoli, and S. P. Teixeira. 2014. Stigma diversity in tropical legumes with considerations on stigma classification. Bot. Rev. 80: 1-29. Cruden, R.W., and S. Miller-Ward. 1981. Pollen-ovule ratio, pollen size, and the ratio of stigmatic area to the pollen-bearing area of the pollinator: A hypothesis. Evolution 35: 964-974. Gresta, F., G. M. Lombardo, L. Siracusa, and G. Ruberto. 2008. Saffron, an alternative crop for sustainable agricultural systems. A review. Agronomy for Sustainable Development 28: 95-112. Lage, M., and C. L. Cantrell. 2009. Quantification of saffron (Crocus sativus L.) metabolites crocin, picrocrocin and safranal for quality determination of the spice grown under different environmental Moroccan conditions. Scientia Horticulturae 121: 366-373. Meyer, R. S., A. E. DuVal, and H. R. Jensen. 2012. Patterns and process in crop domestication: an historical review and quantitative analysis of 203 global food crops. New Phytologist 196: 29-48. Molina, R. V., M. Valero, Y. Navarro, J. L. Buardiola, and A. García-Luis. 2005. Temperature effects on flower formation in saffron (Crocus sativus L.). Scientia Horticulturae 103: 361-379. Rubio-Moraga, A., A. Trapero, O. Ahrazem, L. Gómez-Gómez. 2010. Crocins transport in Crocus sativus: The long road from a senescent stigma to a newborn corm. This entry was posted in Botany Lab of the Month, Education, Flavor, herbs, Recipes, The basics and tagged anatomy, carotenoid, climate change, Crocus sativus, flower, Jeanne L. D. Osnas, pollination, saffron, spice, stigma. Bookmark the permalink. Great summary of a lovely flower and delicious spice! I was especially glad to see you point out that the edible crocus (Crocus sativa) stigma are only from the fall-blooming varieties. Spring-blooming crocus stigmata should not be eaten. Thank you for letting us know; I knew that saffron and its closest relatives were autumn-blooming instead of spring blooming, but I didn’t realize that there was difference between the two groups in usability of the stigma. I read your posts regularly and so appreciate them! And I’m very glad that you mentioned that saffron-ricotta-custard on the eggplant gratin. It’s one of my favorite dishes as well and I brought it out again in my new book, In My Kitchen. It has stood the test of time! I can’t wait until summer to make it again. Thanks for the kind comment, Deborah, and for the great recipe! We’re coming up on two years living in Anchorage, AK, moved up from DC, so our home-grown and farmers’ market tomatoes and eggplant situation has changed drastically. That’s probably why I haven’t made that recipe in a while. Think it’ll work well enough with canned tomatoes? Guess there’s only one way to find out! I look forward to reading the new book. 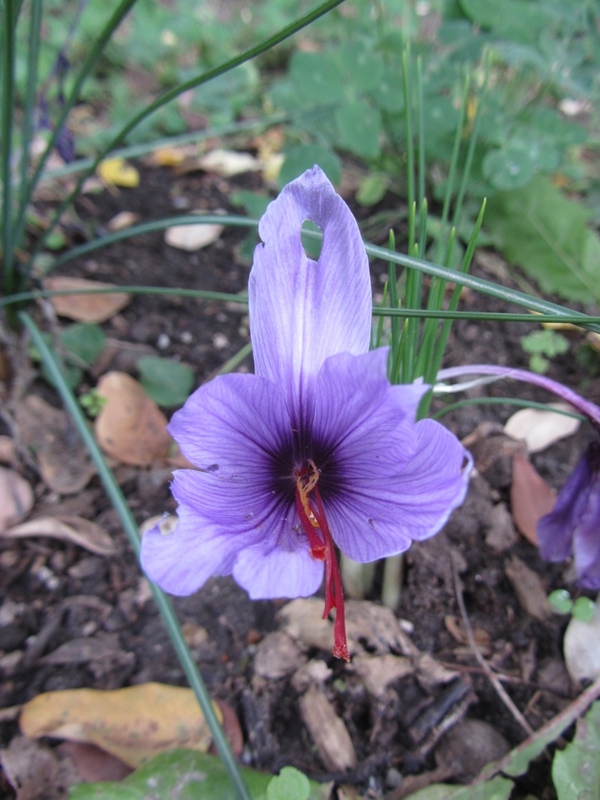 Interesting that this sterile triploid emerged in ancient times, if not earlier, from a presumable ancestor which was probably a direct competitor of meadow saffron (https://en.wikipedia.org/wiki/Colchicum_autumnale), the source of colchicine (https://en.wikipedia.org/wiki/Colchicine), which has been used by contemporary botanists to produce other sterile triploids that humans find desirable, including seedless watermelons. Thank you so much for drawing this connection! Awesome. Thank you for sharing this knowledge about saffron. These made me understand more and more about saffron. Will saffron crocus grow in in New England? I imagine so! It grew fine in DC. Consult your local extension for advice on autumn blooming crocus in your area. Use a pinch! It’ll be great.